A great weekend of Solar for this customer, despite the sea mist that kept rolling in for parts of Cornwall! 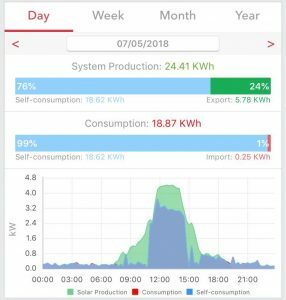 The green  on the graph shows when the PV array was generating energy, most will be used by the household, or stored in the battery, the rest will be exported to the grid (regardless of what you use, all systems under 30kW’s are paid for exporting 50% of their solar). Any red ❤lines show when electricity is being used from the grid (i.e. the stuff you have to pay for). 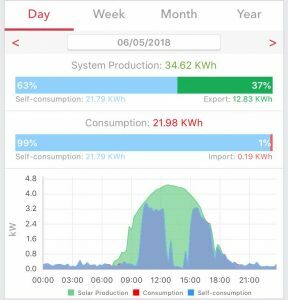 And the blue  on the graph is solar energy the household has used – in this case the solar panels and energy stored in the Tesla battery. They also have an immersion diverter to heat the water which will further bring down the energy bills. Well the important figure to look at is the import figure in red just below the consumption bar. This is how much electricity the home is drawing from the grid and having to pay for. In this case they only drew 0.44 kWh’s of electricity all weekend so spent about 7 pence. Once the battery was 100% charged the immersion diverter kicked in to heat the water and keep in the thermal store for use later. That’s 99% self sufficiency even when it wasn’t your typical sunny day. *Mr S and family have a 5kW Sunpower array with SolarEdge inverter and optimisers. They also have a Tesla Powerwall 1 battery and iBoost immersion diverter.